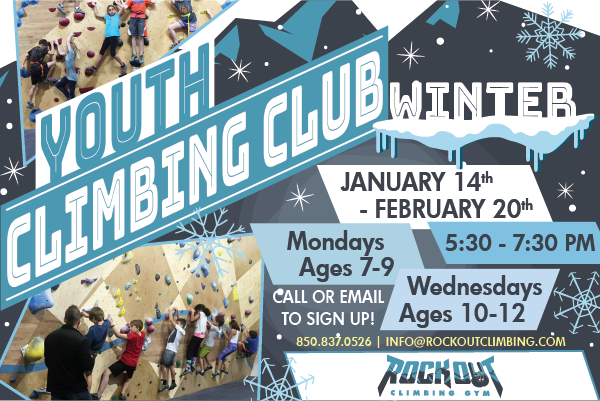 Rock Out Youth Climbing Club B is a six week recreational program beginning Jan 16th and ending Feb 20th for ages 10-12. Youth Climbing Club is geared toward the young climber seeking more climbing experience. Rock Out instructors guide warm-ups, instruction, games and challenges tailored to unique strengths and abilities to ensure positive climbing experiences for all in a challenging environment. With structured lessons and two hours of climbing per week, the Youth Program B promotes technique, strength, and balance through engaging group and individual activities.